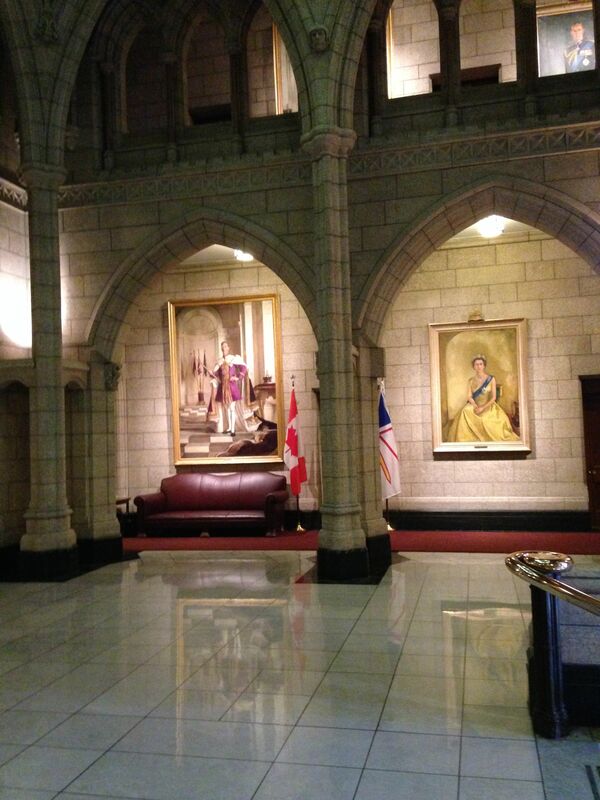 Today we had what was billed as a private tour of the Central block of Parliament. 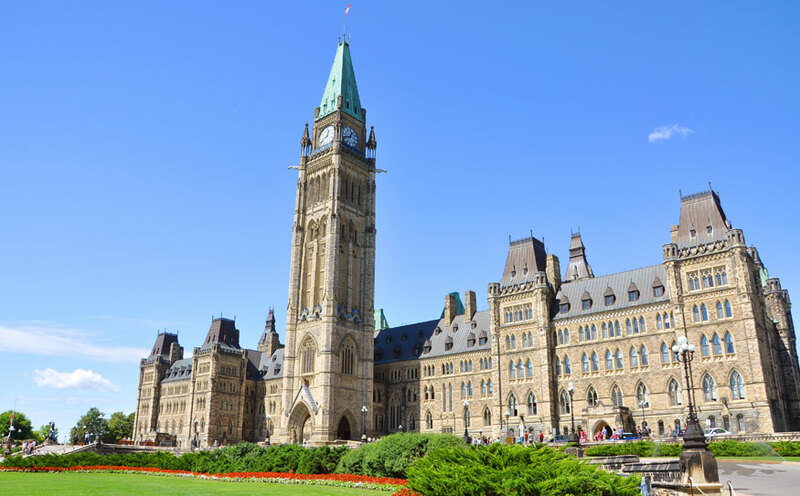 The entire precinct of Parliament in Ottawa is currently going under a major $3 Billion dollar renovation. The West Block and East Block where built in 1864 and the Central block was rebuilt after the great fire of 1916. The other buildings of the Precinct like Confederation block and the old Metropolitan Life building and the old Bank of Montreal and the old Train Station are also part of the project since all those buildings will now house offices and a grand reception hall. The work is painstaking, our neighbour David works on the renovations, his job is to clean the stone work of the West block with a laser. What he has done so far is wonderful, it is a very large building, the stone is sandstone colour with a mix of pink granite. All the roofs are copper with intricate iron work which is very complex work. 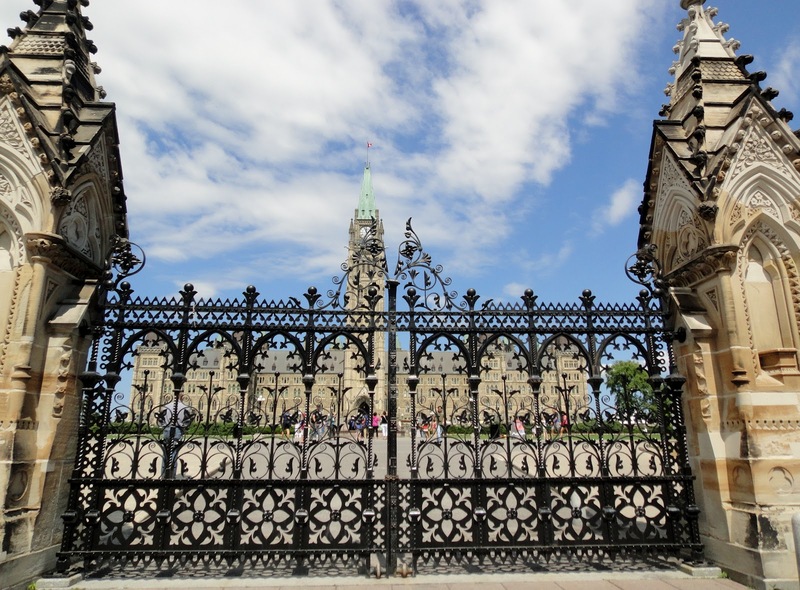 The East block and the West block are high Victorian Gothic style whereas the Central block is Canadian Gothic, the main central block houses the House of Commons and the Senate and the Library of Parliament. 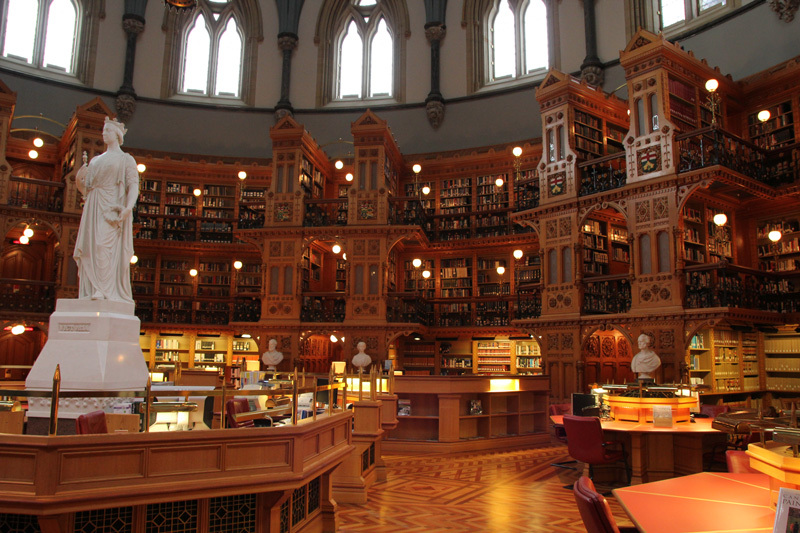 I use to work in Parliament, it was my first job working on the Hill. I loved that job and it was so nice. 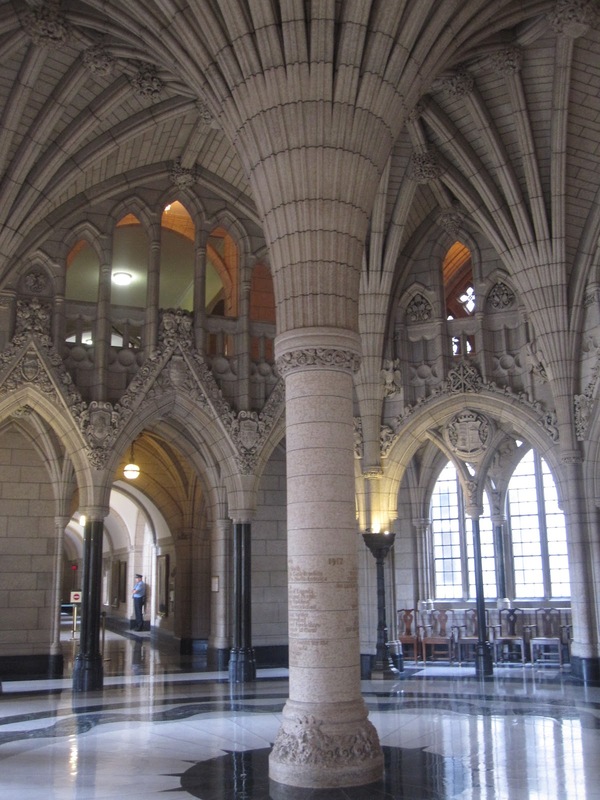 Today as we stood in the Ceremonial Hall under the Peace Tower I thought everything looked small and dingy. 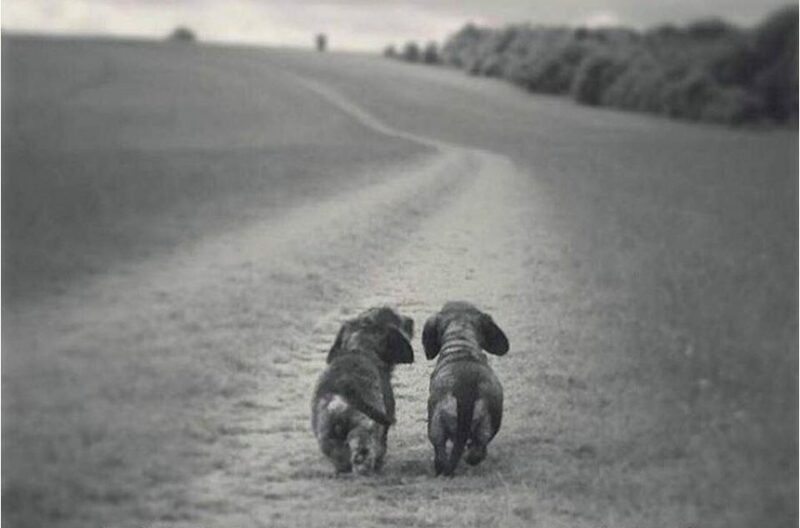 I do not know why but it did. Our guide was atrocious, I could have given the tour. Why do we have employees who are trained to give tours unable to explain anything and do not know the history of the buildings. I know they are moving out in two years while the main central block will be renovated but it all had a sad look about it. It could also be that we have had 10 years of Harper the worst Prime Minister this country has ever seen. I almost regretted going today, the House and Senate are in recess now until next week. Despite the fact no politicians are around there are regiments of guards everywhere. 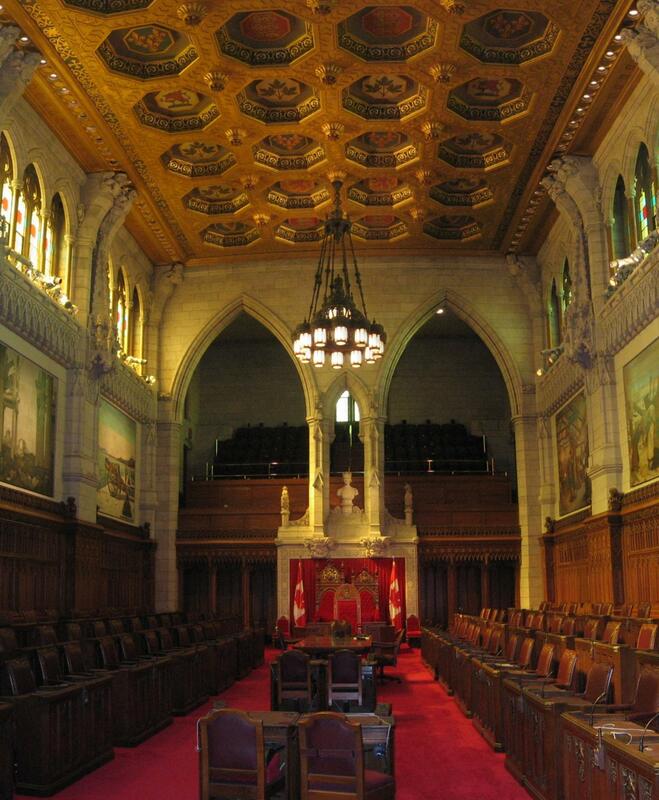 It is not the same place anymore, it use to be a place for Canadians to come and see the work of their Parliament, it now feels like a private club with well armed bouncers. Because the House is not sitting the lights were not on so despite the large windows and bright sunshine the halls were gloomy. The Senate Chamber had no light inside we could barely see anything. Again guards everywhere, nervous and jumpy. Most visitors are families with small kids or seniors. I was not impressed at all with this visit. 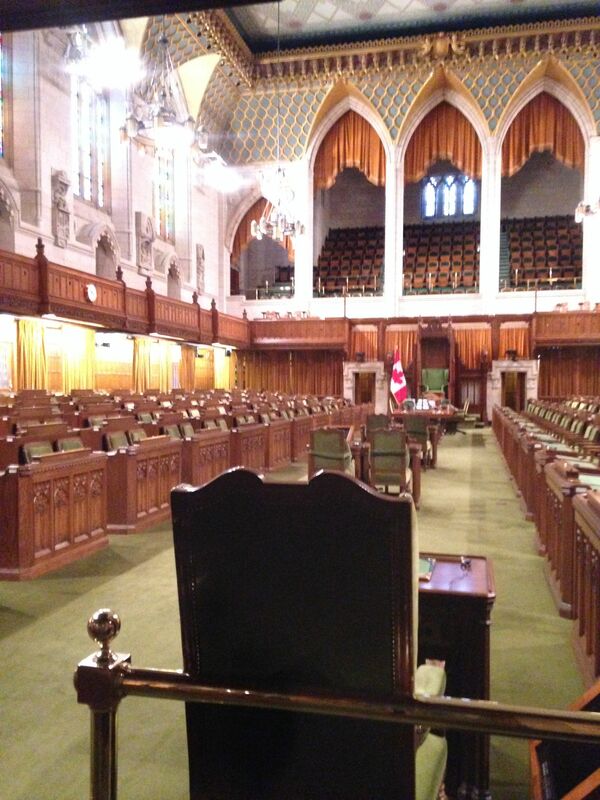 One person asked about the colours in both the House of Commons and in the Senate. The House has a green carpet and the seat are in green leather whereas the Senate as a red carpet and the seats are in dark red. The guide explained that she thought the green colour in the House was because it was a colour used in London at Westminster and red in the Senate represents the Queen. What?!? I cannot believe that no one told her that Red is the Crown and Green is the Commons (people), traditional colours. Same with the many sculptures seen everywhere, she either was not sure or gave a short answer. Many people wanted to know where the crazed gunman had been shot on 22 October 2015. Our guide gave us the bureaucratize answer instead of simply pointing out as I did where he had been shot. It is apparently a State Secret, really its on tape everyone saw it. Had she been clever she could have diverted the conversation to the purpose of our visit instead of giving us the Official Blah Blah. I also found the guards rude and menacing with the public. Again I find that offensive, this is Parliament not some high security secret place. The openness of the place and the Official but friendly atmosphere of years past is gone. It use to be such a different place. 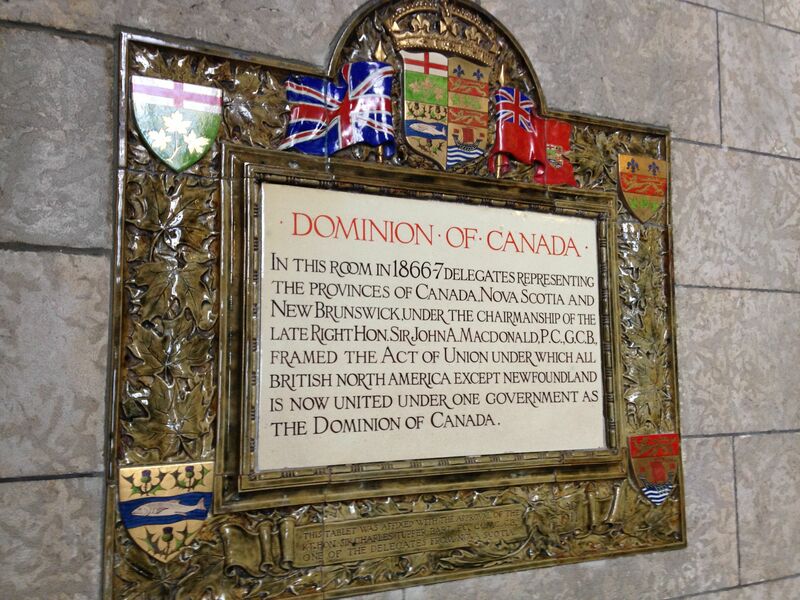 The earliest plaque with the four original provinces, Ontario, Quebec, Nova Scotia and New Brunswick. The Senate Foyer with the paintings of various Sovereigns. 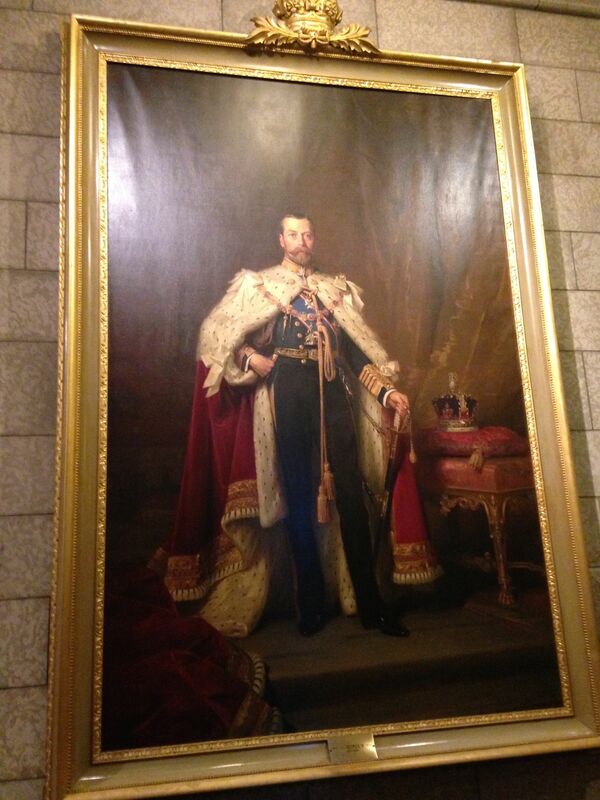 Here George V, King and Emperor. 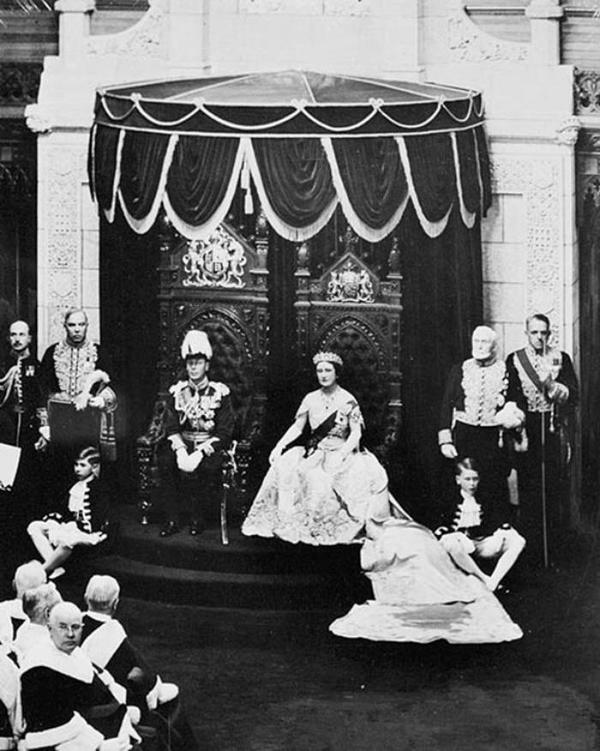 The Foyer has all the Canadian Kings and Queens from George III.